When faced with a decision at a Chinese restaurant, you might choose Kung Pao Chicken. This dish is a healthy choice for most people, containing a range of vitamins and minerals, as well as complete protein. It is also low in saturated fat and calories. It does, however, contain an amount of sodium that may require you to carefully monitor your meal plan to ensure you do not take in too much salt. A 3.5-ounce serving of Kung Pao Chicken contains 129 calories. This accounts for 6.4 percent of the calories you may eat every day if you follow a 2,000-calorie diet. This dish has 6.8 grams of fat, or 68 percent of its calories. Quite a bit of the fat comes from peanut oil and peanuts. Because peanuts are relatively low in saturated fat, only 1.3 grams of the fat in this chicken recipe is saturated. The chicken and peanuts in Kung Pao Chicken provide the bulk of the protein in this dish, with 9.7 g per serving. One serving also contains 6.8 grams of carbohydrates; you need both carbohydrates and protein -- 225 to 325 grams and 46 to 56 grams, respectively -- to provide you with the energy your body needs to properly function. Kung Pao Chicken has some fiber, as well. A serving of this dish contains 1.5 grams, which is just a small part of the 25 to 38 grams of fiber you need daily. One serving of Kung Pao Chicken adds 26 percent of the daily recommended intake of vitamin A to your meal plan. The vitamin A in this chicken dish helps your eyes by protecting your cornea, promoting improved night vision and possibly preventing dry eyes. You also take in 17 percent of the vitamin K you require each day. That vitamin critical to your body's ability to clot blood. This dish is a good source of niacin and vitamin B-6, as well, with 14 percent and 12 percent, respectively, of the suggested consumption. You also get vitamin B-12, vitamin C, vitamin E, thiamin, riboflavin and pantothenic acid. 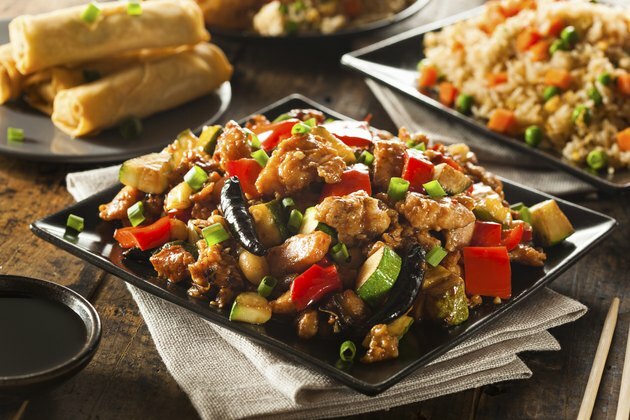 Including a portion of Kung Pao Chicken in your diet helps fulfill your daily need for manganese, a mineral that plays a role in hormone production. Each serving provides 13 percent of the quantity you require daily. This chicken dish contains 12 percent of the selenium you need each day, as well as 10 percent or less of the necessary phosphorus, calcium, iron, magnesium, potassium, zinc and copper. The soy sauce and added salt in Kung Pao Chicken makes this dish high in sodium. Each serving contains 402 milligrams, which accounts for nearly one-third of the sodium limit recommended for most people by the American Heart Association. In 2009, the American Heart Association said that because 69 percent of American adults are "salt sensitive," reducing salt intake to 1,500 milligrams per day may decrease hypertension in the United States considerably. Reduce sodium further in this dish by choosing low-sodium soy sauce, forgoing added salt and opting for low-sodium chicken stock in the recipe.